To test the relative importance of topography versus soil chemistry in defining tree species-habitat associations in a terra firme Amazonian forest. We evaluated habitat associations for 612 woody species using alternative habitat maps generated from topography and soil chemistry in the 25-ha Amacayacu Forest Dynamics Plot, Colombian Amazon. We assessed the ability of each habitat map to explain the community-level patterns of species-habitat associations using two methods of habitat randomization and different sample size thresholds (i.e., species’ abundance). The greatest proportion of species-habitat associations arose from topographically-defined habitats (55% to 63%) compared to soil chemistry-defined (19% to 40%) or topography plus soil chemistry-defined habitats (18% to 42%). Results were robust to the method of habitat randomization and to sample size threshold. Our results demonstrate that certain environmental factors may be more influential than others in defining forest-level patterns of community assembly and that comparison of the ability of different environmental variables to explain habitat associations is a crucial step in testing hypotheses about the mechanisms underlying assembly. Our results point to topography-driven hydrological variation as a key factor structuring tree species distributions in what are commonly considered homogeneous Amazonian terra firme forests. The online version of this article ( https://doi.org/10.1007/s11104-018-3878-0) contains supplementary material, which is available to authorized users. 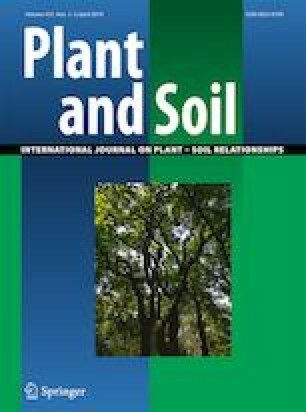 This study was partially supported by the Convocatoria Nacional para el Apoyo a Proyectos de Investigación y Creación Artística de la Universidad Nacional de Colombia 2017-2018 grant 38821 to A. Duque. We would like to thank Parques Nacionales Naturales de Colombia, in particular to Eliana Martínez and staff members of the Amacayacu Natural National Park. We are very grateful for the assistance of our coworkers in Comunidad de Palmeras and the students of forest engineering from the Universidad Nacional de Colombia in collecting the tree census data. We also thank the Center for Tropical Forest Science-Forest Global Earth Observatory (CTFS-Forest- GEO) of the Smithsonian Tropical Research Institute for partial support of the plot census. Many thanks are extended to J. Dalling and C. Baldeck for assistance with kriging, T. Romero and S. Ramirez for assistance with soil sampling, and D. Agudo, A. Bielnicka, and I. Torres for laboratory support. Analyses for this manuscript were first advanced and discussed at two CTFS-ForestGEO Workshops supported by the NSF grants 1545761 and 1354741 to S.J. Davies. D. Zuleta was supported by National Doctoral Scholarship COLCIENCIAS (647, 2015-II). Finally, we are very grateful to Rafael S. Oliveira and two anonymous referees for the comments made to this manuscript.